I decide on a project, find yarn for it in my stash, do a gauge swatch, knit for three or four hours, realize that the project just isn’t working out, then frog it. Rinse and repeat. I think I’ve started—and abandoned (though these don’t count as UFOs ’cause they’re getting frogged immediately)—four or five different things this month. The other day it occurred to me that perhaps I was going about it all wrong. So instead of thinking “I’d like to knit a hat/sweater/whatever,” I went stash diving with the goal of finding a yarn that I wanted to knit with…and then figuring out what to do with it. 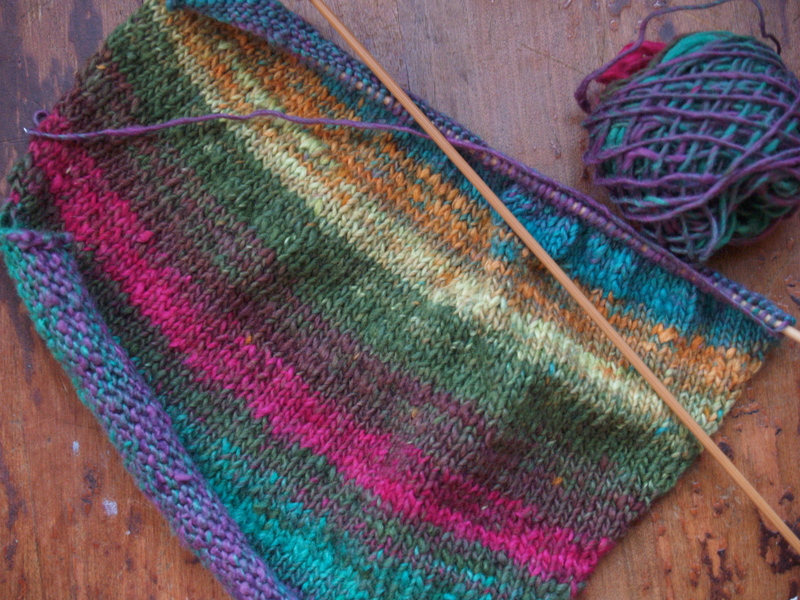 I surfaced with four skeins of Noro New Ruby, which is a lovely 40%cotton/40%viscose/20%nylon blend. (This yarn came from a local knitter’s stash, which was divvied up among my local knitting group about two years after she died.) This stuff has been long out of production—and there’s practically no info on it anywhere online—so there’s no way I can get more of it. 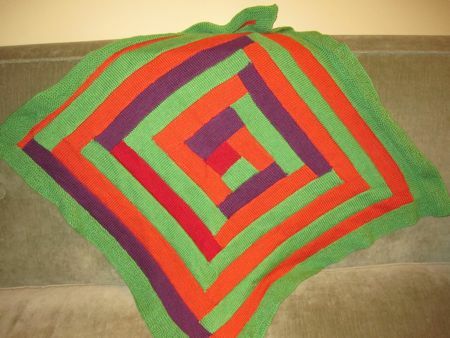 So what to do with not a huge amount of really neat yarn? Sleeves, of course! Not for me, but for Sylvia. I’m sure there’s enough of this stuff for two little sleeves (and maybe a pocket or two). I’m going to use solid-colored yarns for the front and back of the sweater. I don’t have a plan yet for those parts (same color? one color in front and one in back? cardigan? pullover? ), but I figure I can sort it out later. 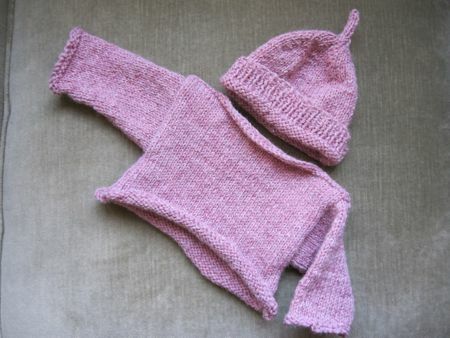 I’m using the drop-sleeve pattern (26″ chest) in Ann Budd’s sweater book, so there are all sorts of ways to tweak this. For now, I’m really enjoying knitting these sleeves. This is only my third experience with Noro, and I can see why people drool over the stuff. The colors are just gorgeous, and I love how the yarn feels. I’m knitting this stuff on #2 needles, but it’s surprisingly fast going. And no, I’m not going to try to match the two sleeves. Let the colors land where they will!